CLICK HERE to find advice from Dean Mosdell, Technical Manager for Syngenta Turf and Landscape in the US. Typically Witea Patch begins as thin yellow rings, ranging from a few inches to a (10 cm to 0.3 m). Rings may be circular or irregular in shape, and may become brown over time. Patches often have a greenish colour behind the yellow ring which tends to be soft and sunken. 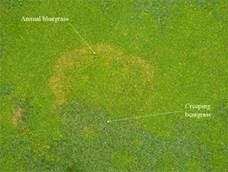 Symptoms are very similar to those of yellow patch, and can also be confused with fairy ring and summer patch. Unlike yellow patch however, Waitea patch tends to occur over a broader range of temperatures, and persists into the warmer weather of the summer. The disease can first appear in the cooler weather of the spring and persist into the warm temperatures of the summer. Infection has been shown to occur between 10° - 35° C with optimal temperatures of 25° to 30° C. The pathogen is thought to infect the upper roots, crown, stem and leaves of individual plants. It also appears to degrade thatch, which can cause sunken rings on putting greens.